With NICs from all over Indonesia & even from Singapore! 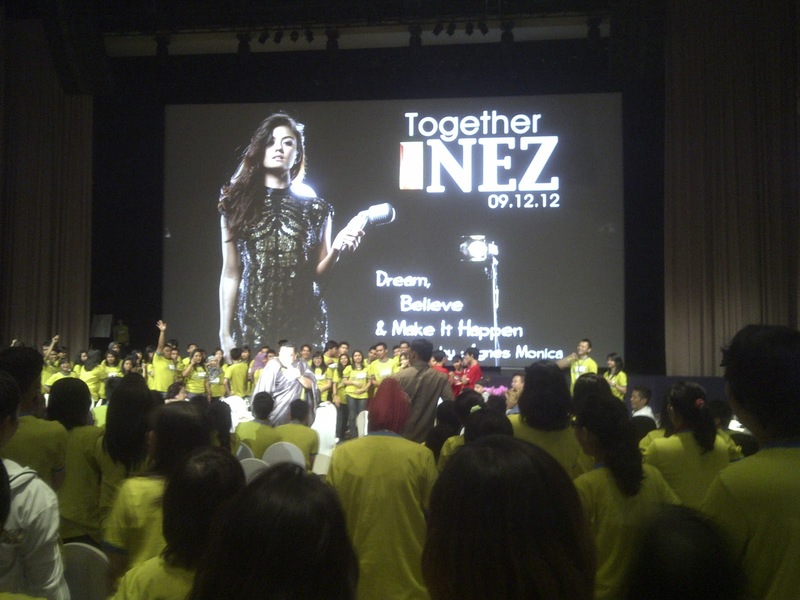 Finally, I could meet the one and the only idol I love, Indonesia's biggest superstar Agnes Monica at fans gathering for NezIndaClub/ NIC #TogetherNEZ. 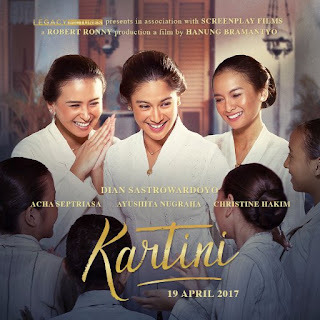 This event was opened only for 250 NICs and held at Djakarta Theater XXI Ballroom, Sunday, December 09, 2012. FYI, NIC is the official fans club of Agnes Monica. And yes, I'm one of her biggest fans, but I haven't registered as the official member. 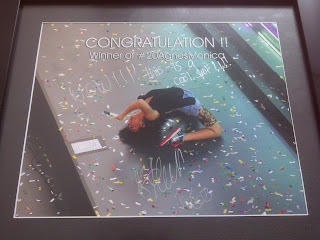 And thanks God, because I was one of the winners of #20AgnesMonica photo competition, I could join the event. I was so lucky! For those who want to know more about this event, you can go to www.nezindaclub.com. 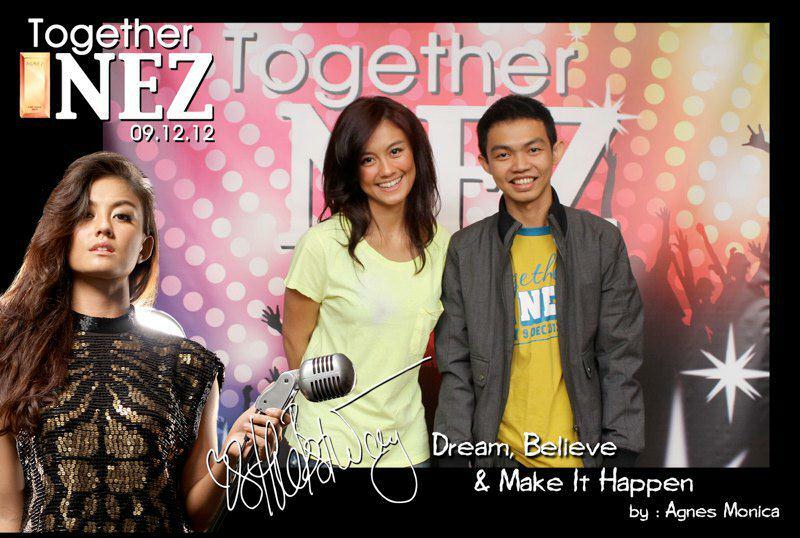 Agnezmo with The winners of #20AgnesMonica (A)! I am so happy! One of my dreams came true. She's so beautiful, isn't she? I ever thought she wasn't human but angel, lol. I remember when I came to the stage and shaking her hands, and then the all winners of #20AgnesMonica taking pictures together with her and I was the last person who receiving the gift from her. And the words I've said to her were only "Thank you. God bless you." I wanted to say more things to her, but I was speechless. Thanks Nez. We had so much fun! Thanks to NIC and Agnes' management for holding #TogetherNEZ. This was one of most amazing moments I've ever had. Because of this event, I can know the other side of Agnes. And I'm glad to have met some new friends. We played games and did flash mob "MUDA" together. Agnes was surprised and looked so happy. I'm never wrong to have choosen her as my inspiration. She was so humble to me, to all of NICs who came. I hope one day when we meet again, she can remember me, haha. I'll always support her to make histories in the world. Dream, believe, and make it happen!